Taking your first cruise? The only thing that can match the excitement of an upcoming trip is the overwhelmed feeling that comes with trying to navigate and plan for your first trip. From embarkation on cruise day to dining to shore excursions, everything you do on a cruise is just a little different than any other vacation you’ve ever been on. That’s why we’ve taken the time to round up a boatload of tips — 57 to be exact — that will help you know better what to expect come cruise day. From the basics details of cruising to how to save some cash, we’ve got everything you need to be confident and enjoy your trip the second you reach the port. Note: This article contains links to Amazon that are affiliate links. Should you make a purchase, we receive a small percentage of the sale. When you go through check-in, you’ll receive the key to your room. This “key” is actually like a credit card that you’ll slide into your cabin door to unlock it. But it actually does a lot more. It’s linked to your shipboard account, and you’ll use your room key just like a credit card to charge items to your account. This is so much more convenient than having to carry around cash. Just be sure to keep a close hold on your card! Wondering if you should get an interior cabin or a balcony room? Don’t sweat it. Balconies are great, but there are some big advantages for interior cabins. As a first-time cruiser, it’s doubtful you’ll be spending much time in your room anyway. Having an interior cabin is a cheaper way to get on your first sailing without breaking the bank. As we just said, interior cabins are great for first-time cruisers who are usually out around the ship the entire trip. But if you do decide to spring for a balcony room, it’s worth it. This is especially the case if you’re the sort of person who likes to take your time getting ready in the morning while sipping on a cup of coffee. Having the fresh air — and the view — from your balcony is worth the extra cost if you want to pay a little more for your trip. Who isn’t turned off by the intrusive security at airports these days? From having to empty water bottles, to taking off shoes, to raising your hands and being scanned by a machine, it’s awful. Thankfully, cruise security is much more like flying used to be. You’ll step through a metal detector and your bags will go on an x-ray machine. There aren’t highly intrusive screen measures in place (at least yet). When it comes to boarding the ship on cruise day, everyone is excited. In fact, you’ll find that many people get to the port before boarding has even begun. The result is a huge rush of people at the start of check-in (unless your cruise line uses staggered check-in). It can take an hour or more to get through security and check-in. Instead, wait until about an hour before the boarding window closes. By this time most people are on the ship and check-in takes just a few minutes. It’s a funny thing about cruises. 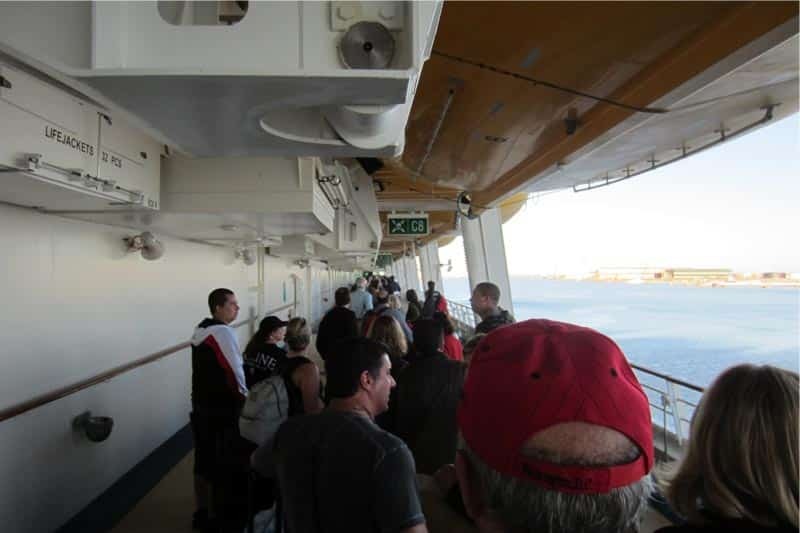 Everyone can’t wait to get on the ship… but then they can’t wait to get off the boat when it returns home. Cruise lines offer early debarkation for passengers who can carry all of their luggage. In our experience, the majority of passengers opt for this route. The result is a long wait to get off the ship. Instead, enjoy breakfast on the ship and depart in your cabin’s normal debarkation time. It’s a much better experience than standing in line at the crack of dawn. The line for early debarkation. Headed to the Caribbean? It’s likely you’ll visit several countries — with several different currencies — with just a few days. The good news is you don’t have to think about converting currencies at each port. The ports you visit thrive on tourism and make things easy for tourists. They will all gladly accept U.S. dollars, and often take credit cards. Just bring some smaller bills for your port days and you’ll be all set. Most people don’t realize it, but the cruise lines will often bend over backwards to make you happy. Case in point: You can order items from the dining room, even if they aren’t listed on the menu for that night. If you just loved the Chicken Parmesan from a few nights ago, ask for it again. Chances are high that they will whip up a serving for you, no questions asked. On most vacations, room service is an expensive luxury. On a cruise, it’s a free perk. You can order breakfast for the next morning by hanging a completed menu on your cabin door, or order a burger for lunch when you don’t feel like going to the buffet. Best of all, it’s typically free (though you’ll still want to tip the server a few bucks). 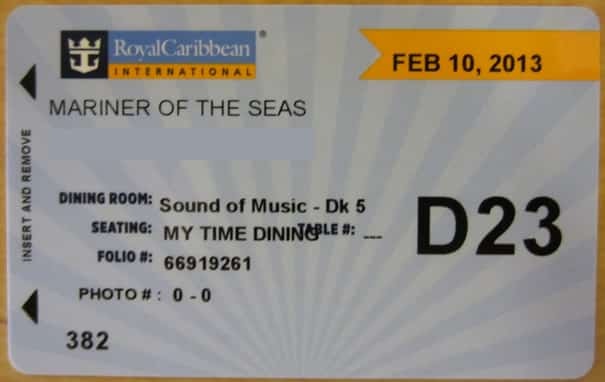 Some cruise lines are charging for certain items on the menu, but they will be clearly marked. It’s also often to see a charge if you order very late at night. Cruise lines know that people want to let loose and have a drink (or ten!) on the cruise. That’s why they charge high prices for their booze. Still, most cruise lines allow you to bring aboard some alcohol when you embark at the start of your trip. It’s very restrictive in that it’s typically only a bottle or two of champagne. Still, we recommend taking advantage as it’s much cheaper than buying drinks once on the ship. If you’ve been tempted by the drink packages, do the math before you buy it. Drink packages seems like good deals, but the rules can make them quite pricey. For instance, many cruise lines force each person in a cabin to buy the package if any passenger buys it. This keeps you from sharing drinks. As well, you have to buy the package for the entire cruise. Want to board first? Want to be first off the boat? Great, hope you like standing in line. Today’s ships carry more than 4,000 passengers at a time. That means there are usually lines for everything, especially right when they open like when it’s time to board the ship. We’d suggest simply taking your time and don’t worry about being anywhere right when it opens. It will mean you spend less of your vacation waiting around and more time enjoying your trip. If you’re driving to the cruise port, then you should know that it doesn’t get any more convenient than with the official port parking lots. They are typically right at the cruise terminal, so you unload and head right to check-in. Of course, they charge for that convenience. If you search for parking lots near the port, you can usually find lots that are nearly as convenient, but at a sharp discount to parking at the port. Plan to stay in town the night before your cruise? If you’re driving in, look for a hotel that offers a cruise parking special. As an incentive to attract guests, many hotels (especially in smaller port cities like Galveston) offer free parking if you stay a night with them. It’s an easy way to save a bundle, but only if you planned to stay the night anyway. It’s typically not worth it to stay just to get free parking. Tipping is a fact of life on a cruise. There’s no escaping it. And while many cruise lines have switched to including gratuities with your cruise fare, there are still situations that call for tipping the old-fashioned way. From room service to porters that carry your bags, having a bank of $1 bills to say thanks with is much appreciated and can lead to better service. There are horror stories after horror stories of people coming back from their cruise with unexpected cell phone charges. The reason is either they use their phone willingly without realizing they are connected to a “roaming” tower or their phone used data without their knowledge for things like updating apps or downloading messages. No matter the reason, you don’t want to accidentally get dinged with a sky-high phone bill. Turn your phone off or put it on airplane mode before your cruise leaves the shore. If you’re worried about sounds traveling through the walls, you should be. To be clear, the walls are not paper thin, so you won’t hear the cabin next to you watching a TV at a normal volume. But if you are the type that makes a lot of noise (ahem… enjoying your vacation with your partner, perhaps? ), then you should try to keep it down. You’ll also be able to hear people in the halls. Most passengers will eat their dinner in the main dining room, but they actually serve breakfast and lunch there too. The buffet is quick and easy for these meals, but the quality is usually lower than what you’ll get in the dining rooms. Head over if you want something a little fancier. If you think that naming something the “drink of the day” means it’s a special, think again. Not always, but often the cruise lines will simply dub a fruity cocktail the drink of the day and charge the same amount as usual. It’s just the drink of the day. A little confusing? No doubt. Instead, just drink whatever you’re in the mood to have and don’t worry if you’re saving money. With everything seemingly so perfect on the ship, it can be easy to think that ports of call are perfect as well. To be fair, ports you visit will be pretty safe, especially in the tourist areas. Venture outside of these spots, however, and it’s just like any other place. There are bad parts of town and places where you don’t want to venture. Odds are you won’t find these spots without looking for them, but be aware of your surrounding at all times and don’t do anything like flash lots of cash or where tons of fancy jewelry. The fact is that most people will never use the travel insurance that they buy. Still, if something goes wrong at sea, it’s a great thing to have. Travel insurance can help covers costs of getting sick or injured, as well as compensate you for travel delays, lost baggage and more. If you’re on the fence about buying insurance, we’d suggest doing so. You can read more about travel insurance and what it covers here. Have your heart set on Cozumel? Just know that cruise itineraries can change for any number of reasons. Whether it be an issue with the ship, weather, or even riots in port. Often the cruise lines will try to sub one port for another, but it isn’t unheard of for them just to scrap a stop in port altogether. Keep in mind that this is a pretty rare occurrence, but it does happen. If you’re flying in for your cruise, then you’re going to need a ride to the cruise port. Cruise lines are happy to offer this service, for a price. 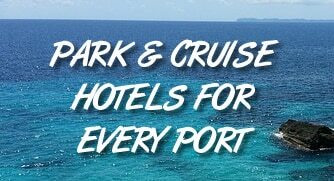 All the cruise lines will offer a shuttle that runs from the airport to the cruise port, but the catch is they are expensive. For example, Carnival offers a ride from Miami International to the port for $16.50 per person, one way. The trip is only about 20 minutes and cabs charge a flat fee of $27 for the trip. In other words, a roundtrip on the cruise shuttle would cost $132 for a family of four, but only $54 with a taxi. Services like Uber and Lyft are also cheaper. Cruise fares are the same across every site. Our advice? Book directly with the cruise line to cut out the middleman in case there is an issue with your reservation. Save the space and leave the hair dryer at home. Each cabin comes with a hair dryer for your use. They usually aren’t fancy, but get the job done. Even better, let the breeze on the top deck dry your hair for you. From portable fans to laptop and tablet chargers to nightlights to curling irons, the need for outlets in a cruise cabin is always increasing. That’s why we suggest bringing aboard an outlet adapter like this one to plug in and give you more free plugs. One thing to know — adapters with surge protectors are forbidden. A simple multi-plug adapter is all you really need and it’s worth its weight in gold. There’s nothing worse than being in an unfamiliar, dark cabin and having to get up in the middle of the night to use the restroom. Save yourself from walking into furniture and stubbing your toe by packing a simple plug-in nightlight. It’s especially helpful if you’re in an interior cabin where there are no windows to provide outside illumination. Anytime you leave your cabin, be sure to put any valuables in the cabin safe. No, it’s not perfect and if someone really wanted to break in and steal something from the safe, they could. But it acts as a good deterrent from crimes of convenience and provides you with a little piece of mind. The safes aren’t that big, but will hold cash, jewelry, phones and passports with plenty of room to spare. Every cabin has its own safe. Use it. The cruise line might sell it as a private balcony, but there isn’t a whole lot of privacy. Your balcony on your cabin will have walls that shield you from the adjoining cabins, but the walls don’t go from the floor to ceiling. They can easily be looked under or above, and someone could look around the side of them if they really wanted to. Keep this in mind if you’re out on the balcony when the mood for romance strikes. We all know drinking is part of cruise culture, but the cost can soar quickly. That’s why it’s a good idea to head to port if you want to get your money’s worth. Most of the party bars near the cruise terminals will have drink specials designed to get you in the door. It’s much, much cheaper than drinking at a ship’s bar. The elevators are the hub of today’s modern ships. You’ll see everyone pass through over the course of a cruise and for good reason. With more than a dozen decks on a cruise ship, going up and down via stairs is time-consumer. But with so many people using the elevators, it’s common to have to wait awhile before you get one. That’s why if you are only going up or down three decks or fewer, it’s usually faster to take the stairs. Plus, it will help you work off some of those buffet calories. No, you don’t have to buy a tux or an evening gown for your cruise. You won’t be out of place if you do, but formal night actually isn’t that big of a deal. On these nights, plenty of people dress up, while others just put on a pair of nice pants and a button-down shirt. Our advice? Just where what you would to a job interview (so no shorts or t-shirts) and you’ll be just fine. Grab a drink from the bar? Your bill will typically include a 15% gratuity automatically. Keep this in mind and double-check the itemized receipt before you sign as there is often another line for write-in tips. Unless the service was simply above and beyond, there is no reason to give a second tip on your drink. Everyone tells you to be sure to wear plenty of sunscreen on your cruise, but they don’t tell you way. At lower latitudes the sun’s rays are more direct on the ground. The result is that you can get burned being exposed to the sun for as little as 10 minutes if you aren’t used to it. So yes, wear the sunscreen, as well as a broad-brimmed hat to keep the UV rays off you as much as possible. The last thing you want is to look like a lobster on day 3 of a week-long cruise. News stories always hype up the biggest, newest cruise ships, and the cruise lines charge a pretty penny for sailings on these boats. If you’re looking to save money, look for trips that sail on older vessels. These ships are still in great shape (and are often refurbished), but offer fares that are hundreds of dollars less than a similar sailing on a new member of the fleet. Most of us are used to air travel, where you are charged sky-high fees for checking in baggage. Cruise ships are completely different. There are no fees for luggage and no hard rules for how much you can bring. It’s a nice change of pace from flying, but don’t go crazy. Remember that even though you can bring more on board, you still have to lug all that luggage around. If you’re bringing more than one large bag for a week-long cruise, then you’re packing too much. Traffic ticket that you never cleared up? Some other run-in with the law? If you have a warrant, don’t think about taking your first cruise. It’s a well-known tactic by law enforcement to check the passenger manifest against those with outstanding warrants. They often let the passengers sail on the cruise, and bust them when they come back. Get it cleared up before you and you won’t have anything to worry about. Most people don’t have an issue with seasickness on a cruise as the ships today ride smoothly in the water. But if you are worried about it, then look for a cabin that is as low and close to the middle of the ship as possible. The action of the waves causes the ship to pitch up and down the most at the end of the ship, with the middle acting as the fulcrum on a see-saw. There’s no guarantee you won’t feel the motion, but it should be better than getting a room toward the front or back of the ship. Chances are high you’ll need to visit Guest Services as least once during your trip. If you do have to go to ask something about a reservation or your account, try to time your visit to off hours (the desk is open 24 hours a day). Times like just before dinner can see long lines, when you’d rather be out enjoying yourself. Early in the morning (before 8 a.m.) and late at night (after 11 p.m.) are the best times to see the shortest lines. Elevators are the heartbeat of the ship. With 4,000 cruise passengers trying to go up and down on more than a dozen decks, elevators are constantly busy, no matter the time of day. That’s why you should always wait to enter only after people have gotten out. It’s polite, but it also makes getting on and off much easier. Just stand far enough back to give people plenty of space to exit. While every cabin has air conditioning, they don’t have fans of any kind. That’s not an issue if you have a balcony and open your door, but any interior room is going to get a little stuffy — especially if you’re the sort of person that’s used to airflow. Luckily, you can bring aboard a portable fan like this one. As a bonus, a fan makes a great white-noise machine to help drown out any sounds from neighboring cabins. If you have a pair of cheap flip-flops that you like wearing around the pool, then it’s time to upgrade. Those sandals usually have slick bottoms that get worn down easy. When you hit a puddle, it’s easy to lose your grip and slip. On a ship, there are way too many places where you can slip and fall — especially around the pool. Upgrade to a pair that have a nice rubberized sole with plenty of tread. Think the most valuable thing you’re carrying is the money in your wallet or your purse? Think again. Potential thieves would love to get their hands on your passport. That’s why we like to put our passport in our cabin safe and carry a photocopy of the ID page with us in port. If you run into a situation where you need a passport (rare), this page can serve as ID until you get back to the ship. Meanwhile, you don’t have to worry about your actual passport getting nabbed in a port. If you want to gamble, head to Las Vegas. On the ship the games are the same, but the payouts are usually worse. For example, on most ships blackjack pays 6-to-5 instead of the usual 3-to-2. Craps games heavily limit the amount of odds bets you can make. Head to the casino, enjoy yourself, but don’t think you’re getting a great deal. Even if you are headed to the sunny Caribbean, it’s still a good idea to bring some warm clothes. When the ship is sailing and the sun has gone down, the combination of cooler temps and a strong breeze make it downright chilly on the deck. In addition, many spots in the ship are well air-conditioned, meaning you can be cool indoors as well. If you want to hang out with a younger crowd, then the time of year you sail is the biggest factor. Ships see younger crowds when school is out — Spring Break, Christmas, and Summer Break. And if you’re looking to avoid younger folks and have a quieter cruise, then try to sail when school is in session and people are heading back to work. Months of January and February, as well as September and October will see the oldest crowds. The rule of thumb is that cruises are most expensive when school is out. That’s because families are able to take trips, driving up demand. So if you’re flexible with your dates, you can sail during off-season like January or October and save some considerable dough. The same trip sailing in late January can be 50% the cost of the same sailing that departs at the peak of summer. If you want to have a calm, quiet cruise, then look for trips that are 7 days or more. Shorter cruises, which are less-expensive overall, tend to attract younger and more wild crowds. That’s not to say it’s going to be like Mardi Gras, but shorter cruises — especially those traveling during the summer months — will definitely be a bit rowdier than what you’ll see from a week-long trip. If you’re sailing to the Caribbean, the first image that comes to mind is white, sandy beaches and clear water. But what do you do with your cash, wallet, phone, and anything else you don’t want to get wet? You can either leave it on shore as you swim (and risk it getting snagged) or risk it getting soaked in the water. That’s why a dry-bag like this one is a great investment. It’s cheap, compact, and keeps all your stuff safe and sound. Your first thought when you see the prices of shore excursions is that they are expensive. It’s not unusual for a shore excursion that is just 3-4 hours run more than $100 per person. But we think this is one spot to splurge on your trip. Excursions give you a chance to do things you won’t have the opportunity to do anywhere else in the world — from exploring ancient ruins to taking a submarine under the Caribbean. After your trip you won’t remember the money you spent, but you won’t forget the experience you had. Know how cruise lines advertise ridiculously low fares? Well, just know that they are just the start of what you’ll pay. In addition, you’ll have to pay taxes and port fees, which can run into the hundreds depending on your specific trip. Add to that gratuities, which run about $15 per person, per day. Combined, these fees can add 30-50% to the cost of your cruise. Be prepared. Want to check email, surf the web, or call/text back home? Prepare to pay. Out at sea, the only communication is via satellite. Every cruise ships will have packages that allow you to call or get web access, but they charge a high price. There are several work-arounds (such as International plans that will give you cell phone service in port cities), but for most people, it’s best just to turn off your devices and enjoy being disconnected for a few days. Check out the video below. Don’t let this happen to you. The departure times for port days aren’t suggestions. You should be back on board by that time and not a moment later. The last thing you want to do is be a “pier runner” or worse, miss the boat altogether. 54. No Habla Espanol? No Problemo. Many of the ports in the Caribbean and Mexico are Spanish-speaking countries, whereas others may speak Dutch or French. Don’t worry. You don’t have to be multi-lingual to get by. The cruise ports thrive on tourism and they make it as easy as possible for foreign tourists to get around. Practically everyone you encounter will speak English, so you can leave the Spanish dictionary at home. Not the sort of person that likes having your picture taken by strangers? Get ready, because it will start before you even step foot on the ship. It’s big business on a cruise for roving photographers to take pictures of guests having fun. The pictures are then sold in the photo store on the ship. To be fair, the photographers are great and it’s a nice way to get a professional photo done to remember your trip. If you don’t want a picture taken, you can just politely decline. And there’s no charge unless you decide to buy the picture. If you think that bottle of tequila you just bought in Cozumel will make for a fun evening, think again. Just like on embarkation day, you can’t bring on bottles of booze from ports. Anything bought in port will be held on the ship and delivered back to your stateroom the night before you leave. You sure you want to take that first cruise? One thing they don’t tell you in all the brochures is how addicting it can be. A week of being catered to, eating great food, and visiting multiple exotic ports is hard to forget when you head back to work after your trip. In fact, many people book their next cruise while on the ship. But let’s be honest… there are worse habits to have than a cruising habit! Have more tips that are ideal for first-time cruisers? Let us know in the comments below! Just returned from our first cruise and I am so glad I read your ‘tips and advice’! They really helped! And yes, they are ‘addicting’! Already booked for this summer out of NYC on a 4 night with new Carnival ship to Bermuda!!! YAY!! Love to hear you had a great time! Yes there is, but only in designated areas. It’s not allowed in your cabin or on your balcony. Wow, it’s interesting that you said that there are no luggage fees in cruises, and we can bring as much as items as we want to. My family and I are going to look for a cruise trip for summer because it has been of our dreams ever since my husband and I got married. Our kids were also very excited when we told our plans with them. We will keep these tips in mind. Thanks a lot! My favorite part of this article is when you said that booking the balcony room is the best choice. As you mentioned, it is perfect for those who take their time in the morning while drinking a cup of coffee with a view. This is perfect for my husband and me because my husband is way too slow in the morning since he is a night owl. Actually, ever since we were dating, he would never choose to go out in the morning. Thanks!